I am always on the lookout for unique, timeless accessories that I can wear with numerous outfits and if they are sustainably made, it’s a bonus! 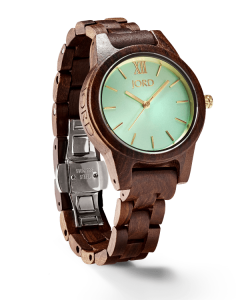 I was thrilled when I learned of Jord, a company that makes beautiful wood watches for Men and Women. Jord’s mission is ” focused on creating timepieces that are modeled after a modern lifestyle. We value sustainability, efficiency, and experiential living. We make our watches for people who don’t just have somewhere to be, they have somewhere to go.” I identify with this mission a lot and appreciate a company devoted to making high quality products that appeal to fashionable consumers like me and you. Here are some of the top reasons I fell in love with Jord watches. Yes, these watches are made out of wood, and they are still as durable if not more durable than watches made of other materials. 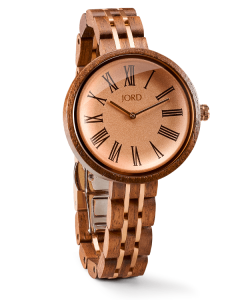 Jord uses high quality materials in all of the watches and ensures that the wood they use is sustainably-sourced. That means they use wood that is not on any endangered lists of species. You can look up more information on this on their materials page. I appreciate that they have detailed information about everything from the wood, the movements (aka the inner-workings of the clock), to the face–which by the way is made of sapphire. All Jord watches come with a one year warranty and they do allow returns and exchanges if you have any issues with the watch you received. 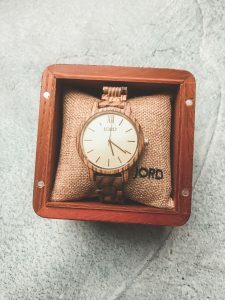 One of the things I love the most about the Jord watch is that the beautiful wood they are made with and that the colors they are made in can match almost any outfit and accessories. 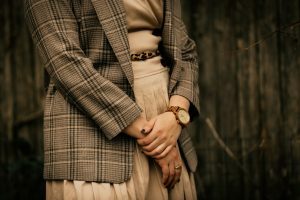 The watches vary in designs from simple to quite complex, but all with the same beautiful artistry that can be difficult to find.I styled them with this vintage outfit and it matched perfectly! I think it would also match a number of other outfits I have. Just like you, these watches are so unique! 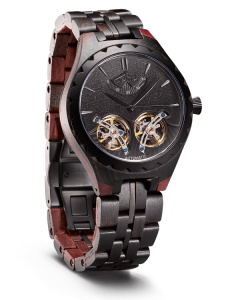 I have never seen a watch quite like this–trust me they are different from anything else on the market right now. I also like that Jord has an easy to use sizing guide available on their site that you can use to make your watch custom fit to your wrist. It feels much more personal when a watch arrives at your doorstep and you don’t have to take it to a jeweler to get it adjusted. I also love the variety of unique designs and colors that Jord has available. I chose the champage and zebrawood design, but to be honest I had a hard time deciding which one to choose. Here are some of the other designs that caught my eye…I mean can you even?! I would get this one for Mike if he wore watches! 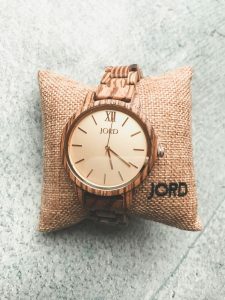 I believe that a high quality and unique watch can make the perfect gift and I especially think the Jord watches make a very thoughtful gift. Each watch arrives carefully packaged in a cedar humidor box that can easily be engraved. You don’t even need to wrap this box, it’s so pretty! Take a look at how my watch arrived–I was impressed with how carefully and beautifully it was packaged. The backplate of each watch is also engraveable. When you take a closer look at a Jord watch, you can truly appreciate the craftsmanship in this timepiece and it is clear that this company has an attention to detail. The wood is a beautiful grain, and feels sturdy in your hand, but not heavy. The style that I purchased has a larger clockplate and I love the champage shimmer on mine, and the high quality is evident. It’s almost too pretty to wear! Finally, I appreciate that it comes with extra links in case my wrist size changes, a cleaning cloth, and as I mentioned before, a beautiful cedar box. Everyone who enters will receive a 10% off code automatically! This is amazing! I never thought of a watch made out of wood. This is very unique. Nice gift idea for this coming Holiday season. I love how unconventional it is too, I hope you entered the giveaway! These are beautiful watches and just my style! I am going to ask for this for Christmas. Thanks! Thank you, I hope you entered the giveaway! Very nice designs! Will be a nice gift! Yes, they make wonderful gifts! These are gorgeous! I love anything that is shabby chic and woodgrain for an accessory is really on point. I socially and environmentally concious company is a bonus ! I too love how environmentally conscious they are! Oh I love that watch, it beautiful. The color is neautral too and can goneith any color. Great post.